Crystal's Crafty Creations: Geared up for Father's Day! Geared up for Father's Day! I hope everyone is enjoying their Thursday....My title is a little cheesy I know I just couldn't resist...LOL!!!! I just received this fabulous new SU Punch Cogs...This thing is SWEEET, I was thinking robots...etc...when I bought it and the possibilities could be endless.....but I thought I would just play around with it and do a CAS card today. CAS cards are not my friends at all, this is one area I struggle with. 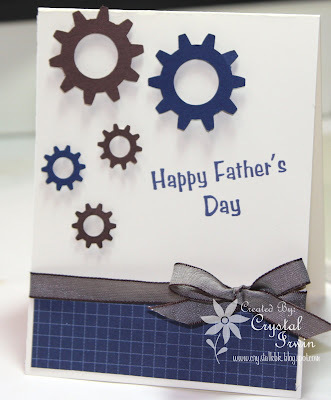 CAS-tastic has a Father's Day challenge going on so I thought I would play along and this COG punch would work well with this challenge. Hope you enjoy my card!!! Also I am super excited on the response so far to Trade It Thursday!!! Thank you guys so much, I keep thinking up more and more items..so stay tuned!!! I hope you all have a wonderful night!!! How fun! Perfect for a fathers day card! cheesy huh! now THAT'S funny! Great guy card! Those are soooo difficult! Gorgeous card. I love the colors! You did a great job with the CAS design, Crystal, and you tackled a guy card, too...WOW!!! I love the wonderful colors and the little cogs look aweosome!!! Awesome card, Crystal! I almost purchased the cog punch...and you are such an enabler! Hugs! Awesome father's day card, Crystal! Very cool use of that punch ... love it, Sweetie! You do CAS gooooooood! Thanks for joining us in this week's CAS-tastic Wednesday Clean And Simple 'Father's Day' card challenge! Luv those gears! :) Great job on the guy card Crystal! Have a wonderful weekend! This is great! Very creative for a masculine card, love it! What a fab CAS card, Crystal! Love it! Simple and clean cards are the hardest and you ROCK! Beautiful work!!! Lol I think the title is very apt Crystal especially with the cogs they look fabulous I love it. How fabulous is this card?! I think you hit it on the spot with a great CAS card, and a Father's Day one to boot! You've got me convinced that I need this punch some day too. supa cute! great fathers day card. what a great card Crystal! I love the simplicity of it but yet it's so effective! wonderful father's day card hun! Oh no, I'm gonna stop visiting your blog Crystal! Cool card by the way! I love Cheese. Eat it every day. I think the sentiment could be "Dad, you are the most important cog in the family, Happy Father's day". LOVE love this! Perfect Father's Day card! Love this cute and fun Father's Day card!! It's just perfect for a Dad!